Monumental twelve panel map of Paris. Plan De Paris, Levé Par Les Ordres Du Roy Et Par Les Soins De Messieurs Les Prevost Des Marchands Et Eschevins. This majestic twelve panel map or plan of Paris is the c. 1900 Taride reissue of an important map originally prepared by Pierre Bullet, Francois Blonde, A. Bonnardt, and Bernard J. H. Jaillot. Like many early maps of Paris, the present example is oriented to the east. Centered on the Ile de la Cité, this map covers Paris from the Bastille to the western end of the Jardin des Tuilleries and from Montmarte to L'Observatoire. This is a geometric delineation of Paris and offers numerous decorative elements, including profile views of all significant Paris buildings including the Louvre, the Bastille, Notre Dame, the Palais Royale, and countless other palaces, hospitals, monasteries, churches, and monuments. The map was issued at the bequest of King Louis XIV and involved some six years of painstaking survey work. This earliest edition of this map was finally issued in 1676. The present example reflects updates to 1710 with additional public buildings, private mansions, and perspective views. 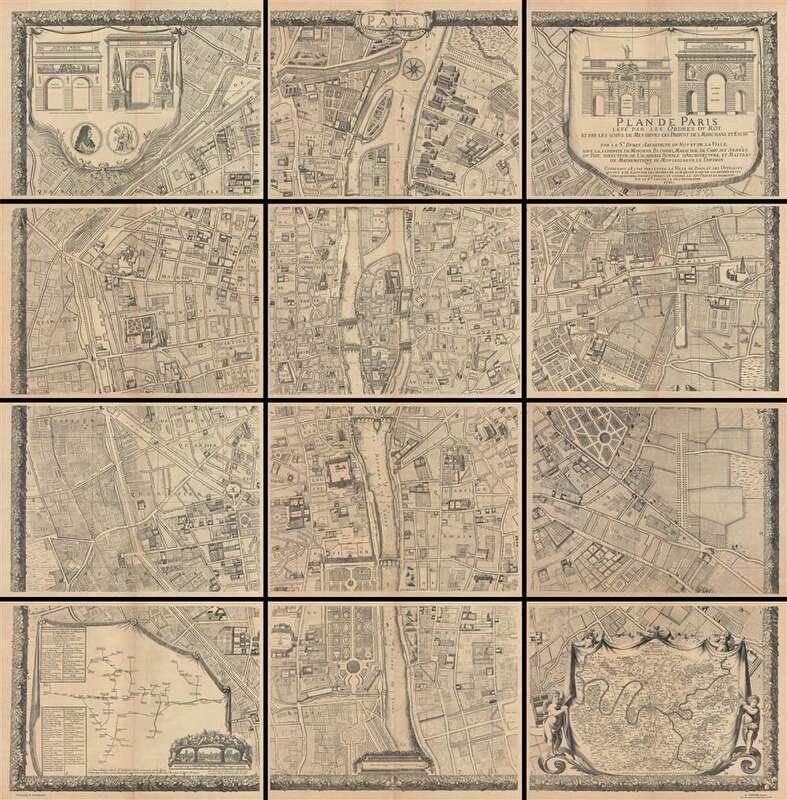 The upper right and left quadrants feature vignettes illustrating the four great gates of Paris: Porte St. Bernard, Porte St. Denis, Porte St. Antoine, and Porte St. Martin. In the lower left quadrant, an exceptionally interesting inset plan details the city's many fountains and subterranean waterworks. Another inset map in the lower right quadrant is entitled the 'environs de Paris'. The whole is surrounded by a decorative oak leaf border. This map presents dramatically when framed, either separately or together, in twelve tightly spaced panels. It can also be joined by a conservator into a single massive wall map of Paris. This is the c. 1900 Taride reissue. The original 1710 plan is today nearly unobtainable. Very good. In twelve separate panels. Overall toning - some variance between panels. Original fold lines. Sheets exhibit typical brittleness associated with turn of the century paper. Size indicated represents whole map, if joined. Comes with original binder. Some sheets have repaired tears. Tears repaired on verso.